Russian мышь [mɨʂ] (help·info) and Polish mysz [mɨʂ] "mouse"
Polish wąż /vɔ̃ʐ/ and węże /vɛ̃ʐɛ/ "snake, snakes"
^ Hellquist, Elof (1922). "torg". Svensk etymologisk ordbok (in Swedish). Project Runeberg. Retrieved 2006-12-27. ^ Hellquist, Elof (1922). "tolk". Svensk etymologisk ordbok (in Swedish). Project Runeberg. Retrieved 2006-12-27. ^ Hellquist, Elof (1922). "pråm". Svensk etymologisk ordbok (in Swedish). Project Runeberg. Retrieved 2006-12-27. ^ Harper, Douglas. "vodka". Online Etymology Dictionary. Retrieved 2007-05-18. ^ Harper, Douglas. "sable". Online Etymology Dictionary. Retrieved 2007-05-18. ^ Harper, Douglas. "vampire". Online Etymology Dictionary. Retrieved 2007-09-21. 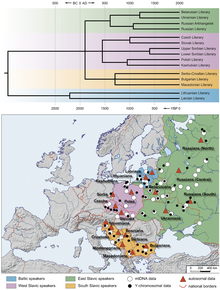 ^ "Indo-European, Slavic". 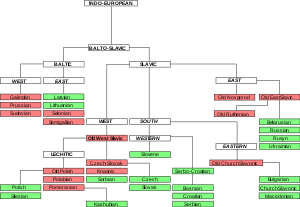 Language Family Trees. Ethnologue. 2006. Retrieved 2006-12-27. Comrie, Bernard; Corbett, Greville. G. (2002). "Introduction". In Comrie, Bernard; Corbett, Greville. G. The Slavonic Languages. London: Routledge. pp. 1–19. ISBN 0-415-28078-8. Schenker, Alexander M. (2002). "Proto-Slavonic". In Comrie, Bernard; Corbett, Greville. G. The Slavonic Languages. London: Routledge. pp. 60–124. ISBN 0-415-28078-8.